FormSmarts allows anyone to create a form quickly and easily with our interactive online form builder. The video below shows how to build a simple contact form. Follow the detailed instructions in this guide to create a more complex form, such as a survey or online membership form. Advanced topics of the form builder like payment integration, form attachments and email recipient management are outside of the scope of this document. Visit the Help section of the website for an extensive coverage of these topics. First, sign in to the online form builder using the email address registered on your account and your password. If you haven't got an account yet, create an account now. Make sure you visit the link in the email message we'll send you to activate your account. You won't be able to log in unless your account has been activated. You are now ready to create an online form. Enter a title for your new form. The title should be short and descriptive. Next, optionally enter a return URL. This is the URL (i.e. web address) on your website where users will be sent to after the form has been submitted. Finally, you may optionally add form filling instructions. Any text you enter will appear at the top of the form. Instructions may include links and basic formatting. Hit the Create Form button. You now need to populate the form with input fields, where users will be able to enter information. Notice that we've now switched to the Fields tab of the form builder. The Fields tab lists all fields attached to the form, and allows you add new fields, edit fields, and change the order fields appear on the form. First, select an input widget. If you are building a simple contact form you will only need single-line Text Boxes (i.e. HTML text control) and multi-line Text Areas (i.e. HTML textarea). FormSmarts also supports the other types of HTML form input fields for users creating more complex online forms. You'll find advice on choosing the correct input field below. Enter a field name. This is the name/label of the input field like First Name or Email. This may also be a question e.g. How would you rate the service? Next, for text boxes only, choose which content form users are allowed to enter in the field. For example, you should select Email for an email field and Positive Number for somebody's weight. This defines which characters and format are accepted in that input field. Selecting the correct type is important to allow form validaton. Refer to the table below for guidance. 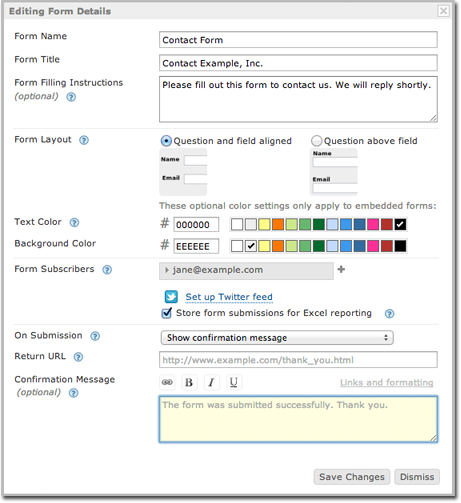 Note that the form builder can often automatically pre-select the relevant Allowed Content based on the field's name. Specify whether the field is optional or not. Users won't be able to submit the form without providing a value for all required input fields. Last, optionally enter a field description. The description should indicate the field's intended content to help the user. For example, the description of a “Message” field could be “Your message to the webmaster”. Now that you've added input fields, the form is fully operational. You can try it, publish it online and start using it. Want to collect form entries on FormSmarts and download an aggregated Excel report? Remember to enable form data storage for each of your form! URL URL A single (URL) web address. Only HTTP is currently supported for the protocol part of the URL. Date date of birth, booking date A valid date. Displays a date picker. Phone Number phone or fax number Any local or international phone number. Country a country Shows the standard list of countries. Note that the country of residence of the visitor is automatically pre-selected. Any Text comment Any alpha-numeric character and punctuation. Only use this input field type when no other type applies. To edit a form, visit the Forms tab of the form builder, and click on the icon corresponding to the form you want to modify. For each of form, the Form Details screen lets you change all form properties: form name, form title, form filling instructions, return URL, and confirmation message. You can also switch form layout, change form colors, and email recipients. Click the duplicate button in the upper-right hand corner of the Form Builder, as illustrated below. You may delete a form in the Forms tab. Click on the icon corresponding to the form you wish to remove, and confirm. Deleted forms cannot be recovered and all stored entries and form attachments will also be delete. If you only need to temporarily suspend a form, disable it as explained in the next section. If you're using an online form to take registrations for a yearly event (or for that matter, any non-continuous process), you will want to disable the form after the closing date until the next event. Use the pause button to disable a form and the start button to restore it. Changes will appear immediately on your website. When a form is accessed while disabled, an error message is shown stating that the form has been suspended by its owner. 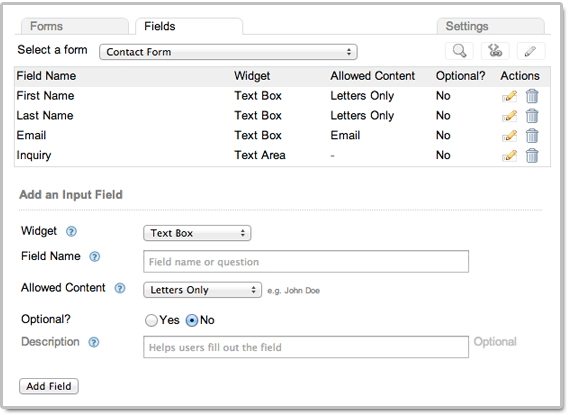 To edit the details of a field, visit the Fields tab of the form builder and click on the icon corresponding to the field you wish to modify. For each of field, the Field Details screen lets you change all field properties. The form's name, description, data type, widget, and optional status can all be changed from that page. You may sometimes need to change the order in which input fields appear on a form. In the list of fields, use drag & drop to move each field to the position you want. To remove an individual field, visit the Fields tab, and lick on the trash can icon corresponding to the field you wish to delete. Because FormSmarts hosts your forms, publishing a form is as easy as posting a link. We give you two options to let your visitors access your forms: embedding and linking. To embed forms on your website, simply copy the code snippet given in the Forms tab of the form builder into the HTML source of a page of your site. You will then need to upload that page to your web server in the usual way. For these reasons, the embedding option is not always recommended. share a link on Twitter, Facebook, etc. You may optionally customize your web forms in the Settings tab of the form builder. When you make a new form, it sent to your login email address by default. If you would like form responses to be sent to a different email address or want to have them sent to multiple email recipients, you will first need to add the email addresses to your account. You will then be able to change the recipients of a particular form in the Forms tab of the form builder. You can increase form users trust and confidence by verifying the ownership of your site. FormSmarts will then display your verified site URL on your forms. We advise you to brand your forms with your own logo whenever your visitors will be accessing forms by their FormSmarts URL. Your logo will then be displayed in the top left corner of your forms, thus increasing their visual appeal and user recognition. Part of designing effective an form is selecting the right input field widget, a.k.a form controls. Here are some tips to help you choose. Example: referral/how did you find us? We currently do not support multiple selections. Use checkboxes instead if you need multiple selections. 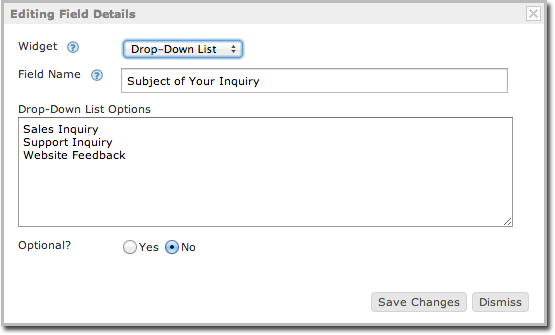 If you want to ask a question and provide a list of options for the answer, use a checkbox list instead. Checkboxes are unchecked by default. The file upload widget allows users to attach a picture or document to a form. The electronic signature widget allows a user to sign a form online. Users can read the agreement document in a scrollable area on the form, pop it out to a larger window or read it full screen as needed.